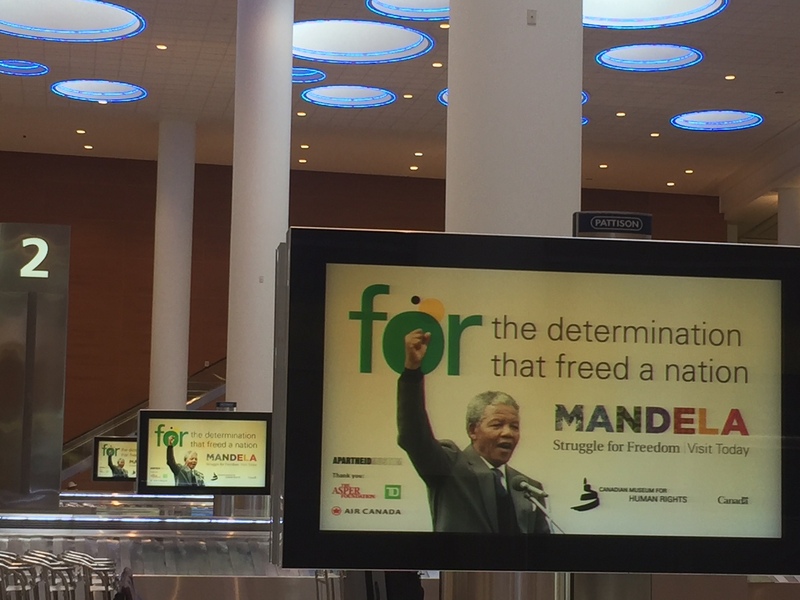 Mandela: Struggle for Freedom is a blockbuster exhibition presented by the CMHR in partnership with the Apartheid Museum in South Africa. Opening in June 2018, the exhibition used the centenary of Mandela’s birth (July 18, 2018) as a tool to drive interest in exploring the story of one of the 20th centuries most revered human rights icons, weaving in Canadian content and including context that enabled a Canadian audience to fully immerse themselves in the story. This exhibition was a labour of love for everyone who worked on it, and the CMHR marketing team knew it presented us with a unique opportunity to drive visitation both at the local and at the national level. For licensing reasons our ability to use certain images and video clips of Mandela was limited, so instead we looked for ways to share Mandela’s story that would provoke an emotional response and create a desire to visit. Thus was born the “27 years for 27 minutes” campaign, with a media mix that included digital, video, TV, radio, out-of-home, ambient and limited print. The call to action in our marketing materials was actually quite simple – “Experience the story for yourself” in the long-form video and driving people from shorter iterations of the video, radio, out-of-home, ambient and limited print to our new beta site through humanrights.ca/Mandela and then using analytics to continuously update our digital buy to drive the results we were looking for. The campaign launched in May, roughly two weeks before the launch event, and had an immediate impact. In addition to paid media, we used our existing social channels to support the marketing push and executed an extensive PR campaign that has resulted in over $5 million in earned media value to date – almost 20x greater than our marketing investment. The first indication of the success of our campaign was on the public launch night – June 7, 2018 – when over 1,000 people packed the launch space, our strongest temporary exhibition launch to date. To stretch our marketing budget, we created Mandela creative for use through our pre-existing partnerships with both Tourism Winnipeg and Travel Manitoba. 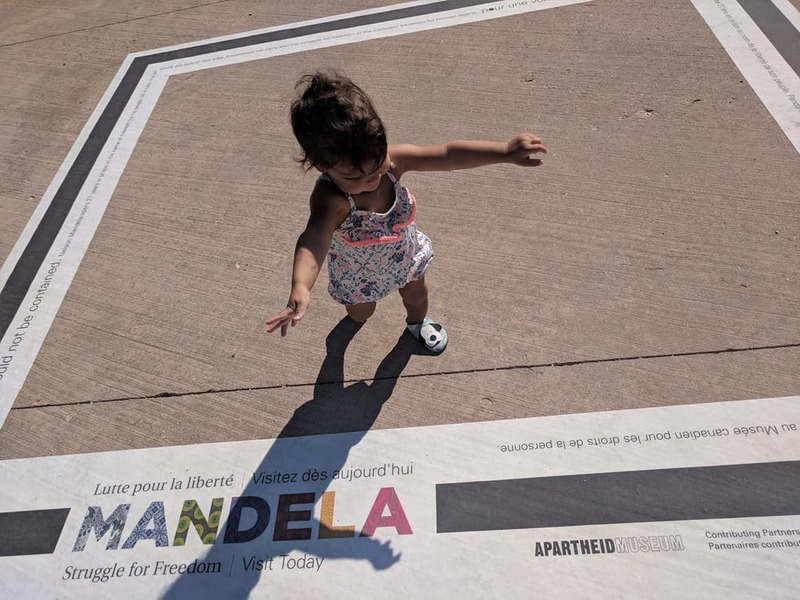 We also secured and used the free $10,000 in Google AdWords available to us as a non-profit, looking for people interested in things to do in Winnipeg as well as Mandela, apartheid, social justice, anti-racism and human rights. We are very grateful to Air Canada, one of our exhibition sponsors, as they comped us pre-play space for a 15-second version of our video on domestic flights from September to December, an in-kind gift worth thousands of dollars. We were also gifted in-kind support by Pattison, who provided us with between 10 and 20 comped out-of-home placements throughout the city, supplementing our digital out-of-home contract with them. Canadian Museum of Human Rights | Mandela. Photo of ambient and photo of out-of-home. Airport carousel signs featuring the campaign. Outdoor decal featuring an outline of the cell that Mandela spent 17 of his 27 years in prison.